It is like taking a trip down Memory Lane. We have a hodgepodge of collectibles from times gone by and a lot of the stuff is hard to find anywhere else in one place. We have that prefect gift available for that someone who has everything.
" Where Your Childhood Memories Come Alive "
available for folk's to have for a donation. Kind of like what they do on the Public Board-casting TV Channels. (PBS). On TV when you make a $50 dollar donation you get a coffee cup at The Pop Culture Antique Museum we have a wide variety of strange and unique items to choose from. 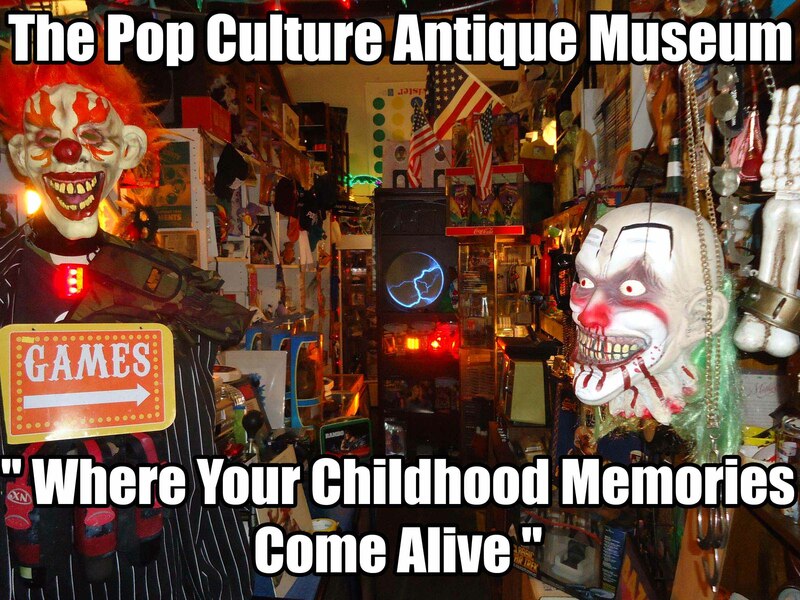 Currently their is over 2,000 sq feet of highly collectible goods in The Pop Culture Antique Museum. We have decided once we are able to find help in listing the items, we can generate additional funds, by putting the contents from the Museum, on the Puffy Paws Crazy GiveAway Page, for a donation, to a world wide audience, along with creating awareness on facebook, highlighting the strange and unique items we have in the Museum ,from eras gone by. Check out the kitties new fund-raising page on facebook to entice kitty lovers from around the world to donate to the kitties by offering cool items from The Pop Culture Antique Museum. We will let everyone one know once we have. The Puffy Paws Crazy GiveAway & Auction page , up and running. We are located off San Casa Drive on Woodgate Ct. If you are in the Englewood's Walmart's parking lot and are facing the far right hand entrance ,which is the Grocery entrance and next to the Liquor Store. Look right and you will a set of storage units, we are the last unit on the left - Unit E.
Also we are in need of any digital cameras, camcorders, computers, lap tops, tablets, video games & systems, DVD's ,that you are no longer using.